Did you get any gadgets for the holidays? iPads, iPhone, Blu-Ray players, HDTVs, remote control helicopters, Kindles, Android devices, ice cream makers, new computers, routers, GPS devices. The holidays seem to be a big time for technology devices. And when the dust (and wrapping paper) settles, you are left with figuring out how to make them work. Sometimes, they are very easy. You push a button and off you go. Other times, the setups are more complicated, with many steps involved. It would, in fact, be useful to capture the steps we go through on these more complicated setups, but too often, we are preoccupied with making the thing work as quickly as we can so that we can start using it. Which is why I do try to take the time to capture various setup instructions in Evernote when I first set up a device, or software, or new toy for my kids. Sure, it takes a few extra minutes, but there are a number of things you can do to speed up the process. For some context: all through junior high school, high school, and the first few years in college, I took a lot of science classes. These classes often involved labs. The science education I got in high school was not bad, but as I’ve often said, it wasn’t until well after college that I really learned science, thanks to Isaac Asimov. I mention this because the one thing that was instilled in me by these science glasses from 7th grade onward, was taking good notes in order to be able to reproduce your results later. I’ve lived by this rule my entire life since. I’m a good note-taker, and I’m good at identifying what is important to capture, and what isn’t. It takes practice–at least, it did for me–but these days, if I capture notes for some installation instructions, I can usually reproduce my work much faster the next time around. Below, are a few examples of how I use Evernote and other tools to capture technology setup and configuration instructions. In the science world, if I was capturing my notes, they’d need to be understandable to any other scientists who would want to reproduce them, so they’d probably be somewhat more explicit than what I have above. Since I’m not in the science world, and these notes are just for me, they need only be good enough for me to understand them. This saves a little time. I can write them in a shorthand that I will understand. Indeed, when I got my new computer, I used these notes to install GeekNote on my new computer with no trouble. A picture is worth a thousand words. Sometimes, I’ll use Skitch to capture a screenshot of what I am doing and include that in the note so that I have a visual reference. The text in bold-red in the center of the note is my own annotation, reminding me of the key formula in the conversion. Sometimes, it takes more than just a single note to capture everything. Not long ago, I updated the network in my house. In doing so, I created an update network diagram that I captured in a note in Evernote. I use this note as a master note for linking to other related notes. You’ll see that I annotated the note (using Skitch) with numbers. Those numbers are keyed to the numbers below the image. 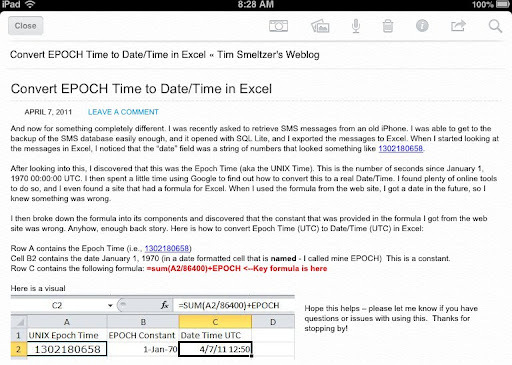 The links are note links to other notes in Evernote. Clicking on one of the links in the note takes me to another note with an annotated photo of the device. The photo typically shows the back of the device, with the wires and ports and I used Skitch to annotate the wires to indicated what they are for or where they are going. This proves incredibly useful when I need to find a problem with or make a change to my home network. The funny thing is, I usually find no need to rewrite these notes or clean them up. I’ll simply use Penultimates “Send To Evernote” feature to capture my instructions in Evernote and move on. I typically depend on Evernote’s search capability to find what I am looking for. I don’t worry much about tagging notes or what notebooks they belong in. I’ll use tags to identify lists or groupings. I do use notebooks, typically when I need to group together common notes to find them quickly. So I have created a HOWTO notebook in which all of these technology notes and instructions go. This way, I have them all in one single place and it makes them easy to skim through and find what I am looking for. Make a photo log of the process. Snap a photo of what the thing should look like at each critical stage of the process. Add these photos to a note in Evernote and annotate the note with the information necessary to make it clear what needs to be done in each step. Going through the process of capturing these technology instructions has made things much easier, not only for me, but for my wife. She can search the notes and find instructions she needs to reproduce to fix something when I am not around. And as you might have already guessed, the principles and techniques I describe in this post can be applied to more than just technology instructions. They can be applied to virtually any kind of instructions you might want to capture. As always, this post and all of my Going Paperless post are also available on Pinterest. Thanks for this useful article. I have a question. How did you create the links to other Notes in Evernote? It’s clear that you are viewing the note in the iOS app, but is that where you created the links – or did you resort to the web app to do this? Barrie, I used the Copy Note Link option on the Note menu in the Mac client to create the note link. See this article for more information. I’m a big Evernote fan and tend to use it in my daily personal life. When it comes to business/work, and the need to collect data in a more “processed” or “formal” way, I feel that datafield is an interesting way to go paperless. The tool will let manager have their field workers or customers kind-of take note but following a pre-defined forms. Manager can instantly view/filter data and take action. Think it is worth mentioning (I mention about Datafield as I’m co-founder but there’s a few mobile forms/mobile survey solution available as SaaS). Great ideas, Jamie. I particular like the Penultimate idea. Physically writing notes helps me think better, so I’ve been toying with the idea of an iPad mini+Penultimate+stylus to replace Moleskine journals. Good to see it’s possible. 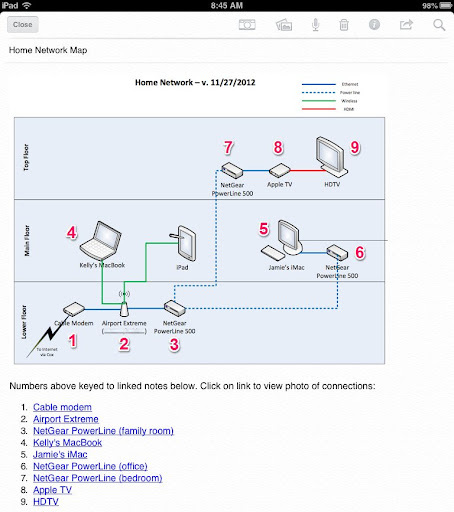 What did you use to create your home network diagram? Luis, I used Microsoft Visio 2010 to create the diagram. I used Skitch to annotate it.